Large shrub with long erect branches. 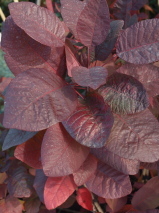 Fabulous large rounded light red foliage in spring darkening through the summer. Beautiful red-gold-orange autumn colours. Showy clusters of dark pink flowers in summer. Hardy. Deciduous, drought tolerant. Sun or semi-shade.